It was another rainy Memorial Day Weekend with cousins – ages 7, 9, and 9 – in constant search of something to do. My 7-year-old son, Calvin, kicked off the weekend with an early birthday gift to his soon-to-be 10-year-old sister, Ava. It was an American Girl school desk with all the school box essentials. He knew going in to the weekend he would be out-numbered as the cousin in the middle was Ravelle, age 9. Typical of each cousin camp weekend, he started out optimistic that he would be included in their play and ended up a bit burned out, frustrated by their undying interest in all things girly. The complaints started to roll in around 7:00p.m. on Sunday eve of the long weekend, “what’s there to do?” We had already seen Epic, the movie, and went mini-golfing at Pirate’s Cove. They were on a fun roll. As we surveyed their slew of American Girl clothes, shoes and accessories, a bright idea popped into Ava’s head. 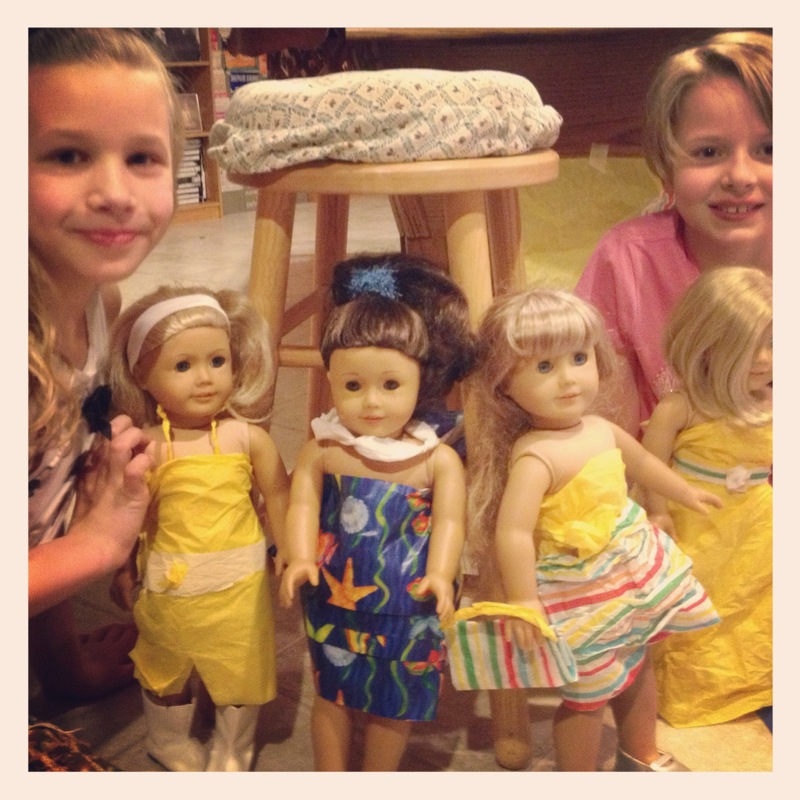 “Let’s make dresses!” she insisted. Now was the how. What was on hand, what materials could we use? 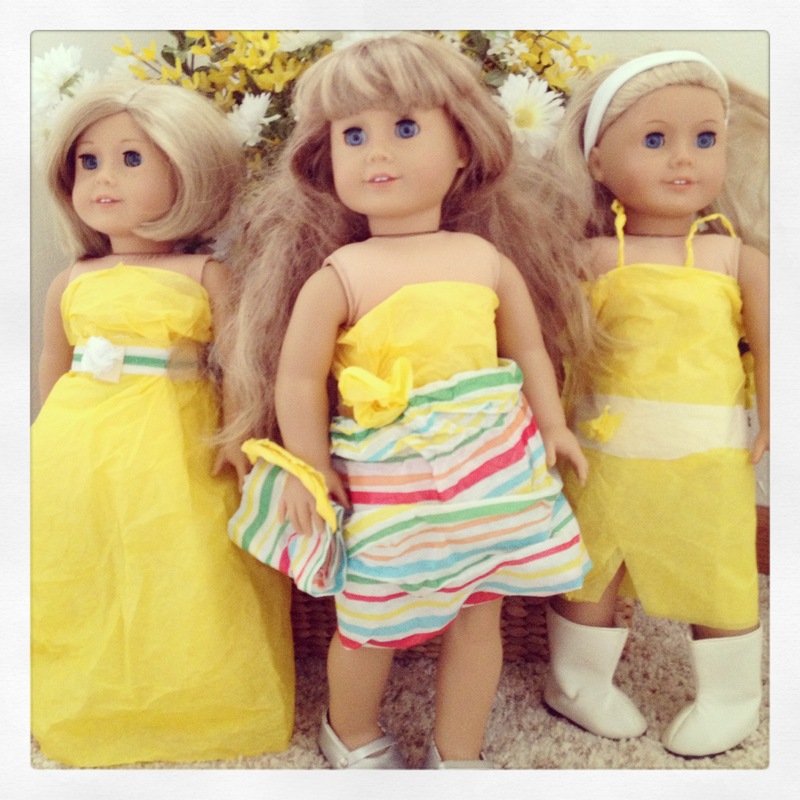 ….ah tissue paper from her early birthday gifts – in bright yellow, vibrant stripes and white. They enlisted Aunt Katie and began cutting, twisting and creating fashionable looks with the paper. The four models – Kit, Kerstin, Piper and Mia (AG girls) – were fitted and styled from head to toe with the right shoes and accessories. An audience of 14 was called to the catwalk and required to sit in their assigned seats. Ava made the opening announcements and the Summer Fun Catwalk was underway.